In terms of techniques, traditional advancement of the mid face with osteotomies and harvesting of bone grafts are associated with high rates of midface regression and morbidity. Distraction in the mid face decreases intraoperative morbidity and rates of postoperative midface regression. Both of these factors have led to an increase in the popularity of midface distraction, demonstrated in a survey of craniofacial surgeons, who reported that the mid face was the site of distraction in 28% of their cases. Views of a person with Apert syndrome are below. Frontal view of a patient with Apert syndrome. Note the classic stigmata of exophthalmos, hypoplastic maxilla, saddle-nose deformity, and craniofacial dysostosis. Lateral view of a patient with Apert syndrome. Note the orbital exorbitism and maxillary deficiency. Osteogenic distraction is the result of the evolution of techniques for bone fixation, skeletal traction, and osteotomy. Osteogenic distraction was first used in orthopedics to lengthen bones after planned osteotomies. However, the complication rate remained high and the technique was not understood until Gavriel Ilizarov, a Russian orthopedic surgeon, performed detailed studies in 1952. Working in a rural clinic in Siberia, Ilizarov did not have the requisite equipment for surgeons used at that time. Therefore, he performed studies by using his own equipment and procedures, which proved to be more effective than contemporary procedures, as evidenced by modern day use of his methods. Distraction of the maxilla was first performed by expanding the midpalatal suture in monkeys in 1965. The first human application of maxillary distraction in craniofacial surgery was a mandible distraction in 1989. Case reports of its application in maxillary distraction were published in 1992. The principle of distraction osteogenesis is based on new bone formation that develops when tension forces are applied. This new bone formation is a result of membranous ossification. The viability of bone cells (osteocytes and osteoblasts) is crucial in distraction osteogenesis. Bone viability can be enhanced by limiting damage to the cortex by making distinct cuts. Bone viability can also be enhanced by preserving the blood supply to the bone, which is necessary for its growth, by leaving adequate soft tissue coverage. Endothelial cells may stimulate angiogenesis and play an important role as well. Distraction histogenesis is a term that describes the gradual increase in soft tissue volume in response to the stress forces applied with bony distraction. Traditional midface techniques provide immediate bony correction but do not allow for compensatory growth of the soft tissues. As a result of scarring and memory, the soft tissue often contracts to its preoperative state. This is thought to be the main reason for the high rate of relapse of midface insufficiency after the use of traditional techniques. In contrast, distraction techniques create a gradual increase in the amount of soft tissue by preventing its contraction. Indications for distraction osteogenesis of the maxilla are craniofacial anomalies, facial clefts, severe sleep apnea, hemifacial microsomia, a deficient alveolar ridge, and complex trauma. Craniofacial anomalies account for most indications for maxillary distraction. Distraction may improve aesthetic contouring of the face, resolve sleep apnea, and improve orthognathics. Distraction can be applied to a wide variety of anomalies with maxillary deficiency; Crouzon syndrome and Pfeiffer syndrome account for most of the reported cases. Advancement of the lower maxilla, as in a Le Fort I osteotomy, or complete midfacial advancement, as in a Le Fort III procedure, can be accomplished. Distraction cannot only achieve the aesthetic goals of realignment but also apnea resolves, obviating tracheostomy. Sleep apnea in select adults with a deficiency in their upper airway dimension may be an indication for distraction. A deficient alveolar ridge is another indication for maxillary distraction. A deficiency of the alveolar ridge may be the result of circumstances, such as traumatic avulsion of mandibular incisor teeth or a congenital deformity. Expansion of the alveolar housing creates a site for the placement of a dental implant. This may improve ridge aesthetics for a pontic, or replacement, artificial tooth or teeth that are mounted on a fixed or removable dental appliance, and it may expand the alveolus to allow for orthodontic tooth movement. Distraction may also be indicated in cases of complex, high-impact midface fractures, especially for the delayed repair of bony fractures of the mid face. The maxilla (see the image below) has several roles. 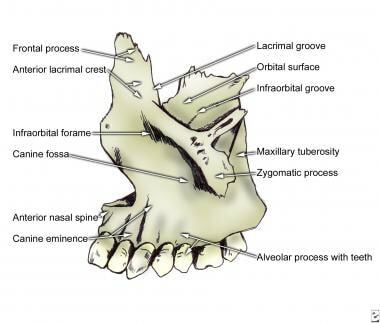 It houses the teeth, forms the roof of the oral cavity, forms the floor of and contributes to the lateral wall and roof of the nasal cavity, houses the maxillary sinus, and contributes to the inferior rim and floor of the orbit. Two maxillary bones are joined in the midline to form the middle third of the face. As long as the bone where the distraction device is placed is adequate, the procedure has few contraindications. Young patients must be selected carefully because of their fragile bones and because the amount of bone available for device placement may be inadequate. In infants, numerous studies have demonstrated successful results with the careful selection of infants, with no untoward effects. The surgeon must preoperatively confirm that the strength of the transport and anchorage segments is adequate to withstand forces of mobilization and transport. Skeletal deformities resulting from bone disease are not a contraindication, as long as enough bone for distraction is available. Last, the patient's participation is as important as the procedure itself. A noncompliant patient can cause any distraction procedure to fail. Marchac A, Arnaud E. Cranium and midface distraction osteogenesis: current practices, controversies, and future applications. J Craniofac Surg. 2012 Jan. 23(1):235-8. [Medline]. Perez D, Ellis E 3rd, Vega OA. Distraction osteogenesis for craniomaxillofacial problems. Tex Dent J. 2011 Nov. 128(11):1159-70. [Medline]. Patel PA, Warren SM, McCarthy JG. Maxillary mucocele with proptosis and visual impairment: a late complication of Le Fort III distraction. J Craniofac Surg. 2013 Nov. 24(6):2000-2. [Medline]. Krimmel M, Cornelius CP, Roser M, Bacher M, Reinert S. External distraction of the maxilla in patients with craniofacial dysplasia. J Craniofac Surg. 2001 Sep. 12(5):458-63. [Medline]. Rao Janardhan S, Kotrashetti SM, Lingaraj JB, Pinto PX, Keluskar KM, Jain S, et al. Anterior Segmental Distraction Osteogenesis in the Hypoplastic Cleft Maxilla: Report of five cases. Sultan Qaboos Univ Med J. 2013 Aug. 13(3):454-9. [Medline]. [Full Text]. Lucchese A, Gherlone EF, Asperio P, Baena RR. The distraction osteogenesis in midfacial hypoplasia. J Craniofac Surg. 2014 May. 25(3):831-4. [Medline]. Satoh K, Suzuki H, Uemura T, Hosaka Y. Maxillo-mandibular distraction osteogenesis for hemifacial microsomia in children. Ann Plast Surg. 2002 Dec. 49(6):572-8; discussion 578-9. [Medline]. Guyette TW, Polley JW, Figueroa A, Smith BE. Changes in speech following maxillary distraction osteogenesis. Cleft Palate Craniofac J. 2001 May. 38(3):199-205. [Medline]. Harada K, Baba Y, Ohyama K, Omura K. Soft tissue profile changes of the midface in patients with cleft lip and palate following maxillary distraction osteogenesis: a preliminary study. Oral Surg Oral Med Oral Pathol Oral Radiol Endod. 2002 Dec. 94(6):673-7. [Medline]. Krimmel M, Cornelius CP, Bacher M, Gülicher D, Reinert S. Longitudinal cephalometric analysis after maxillary distraction osteogenesis. J Craniofac Surg. 2005 Jul. 16(4):683-8. [Medline]. Wong GB, Padwa BL. LeFort I soft tissue distraction: a hybrid technique. J Craniofac Surg. 2002 Jul. 13(4):572-6; discussion 577. [Medline]. Tan W, Yu B, Niu F, Gui L. Changes in width of lower face after unilateral mandibular distraction osteogenesis. J Craniofac Surg. 2012 Jan. 23(1):94-7. [Medline]. Iannetti G, Fadda T, Agrillo A, Poladas G, Iannetti G, Filiaci F. LeFort III advancement with and without osteogenesis distraction. J Craniofac Surg. 2006 May. 17(3):536-43. [Medline]. Koudstaal MJ, Smeets JB, Kleinrensink GJ, Schulten AJ, van der Wal KG. Relapse and stability of surgically assisted rapid maxillary expansion: an anatomic biomechanical study. J Oral Maxillofac Surg. 2009 Jan. 67(1):10-4. [Medline]. Cohen SR. Midface distraction. Semin Orthod. 1999 Mar. 5(1):52-8. [Medline]. Fan H, Wang X, Lin Y, Zhou Y, Yi B, Li Z. [Application of distraction osteogenesis in severe maxillary hypoplasia secondary to cleft palate]. Zhonghua Yi Xue Za Zhi. 2002 May 25. 82(10):699-702. [Medline]. Ghysen D, Ozsarlak O, van den Hauwe L, et al. Maxillo-facial trauma. JBR-BTR. 2000 Aug. 83(4):181-92. [Medline]. Harada K, Ishii Y, Ishii M, Imaizumi H, Mibu M, Omura K. Effect of maxillary distraction osteogenesis on velopharyngeal function: a pilot study. Oral Surg Oral Med Oral Pathol Oral Radiol Endod. 2002 May. 93(5):538-43. [Medline]. Harada K, Sato M, Omura K. Long-term skeletal and dental changes in patients with cleft lip and palate after maxillary distraction: a report of three cases treated with a rigid external distraction device. Cranio. 2005 Apr. 23(2):152-7. [Medline]. Hierl T, Klöppel R, Hemprich A. Midfacial distraction osteogenesis without major osteotomies: a report on the first clinical application. Plast Reconstr Surg. 2001 Nov. 108(6):1667-72. [Medline]. Kessler P, Wiltfang J, Schultze-Mosgau S, Hirschfelder U, Neukam FW. Distraction osteogenesis of the maxilla and midface using a subcutaneous device: report of four cases. Br J Oral Maxillofac Surg. 2001 Feb. 39(1):13-21. [Medline]. Ko EW, Figueroa AA, Guyette TW, Polley JW, Law WR. Velopharyngeal changes after maxillary advancement in cleft patients with distraction osteogenesis using a rigid external distraction device: a 1-year cephalometric follow-up. J Craniofac Surg. 1999 Jul. 10(4):312-20; discussion 321-2. [Medline]. Li KK, Powell NB, Riley RW, Guilleminault C. Distraction osteogenesis in adult obstructive sleep apnea surgery: a preliminary report. J Oral Maxillofac Surg. 2002 Jan. 60(1):6-10. [Medline]. Matsumoto K, Nakanishi H, Koizumi Y, et al. Segmental distraction of the midface in a patient with Crouzon syndrome. J Craniofac Surg. 2002 Mar. 13(2):273-8. [Medline]. Meling TR, Tveten S, Due-Tonnessen BJ, Skjelbred P, Helseth E. Monobloc and midface distraction osteogenesis in pediatric patients with severe syndromal craniosynostosis. Pediatr Neurosurg. 2000 Aug. 33(2):89-94. [Medline]. Morovic CG, Monasterio L. Distraction osteogenesis for obstructive apneas in patients with congenital craniofacial malformations. Plast Reconstr Surg. 2000 Jun. 105(7):2324-30. [Medline]. Papageorge MB. Distraction osteogenesis for augmentation of the deficient alveolar ridge. J Mass Dent Soc. 2002 Spring. 51(1):24-30, 51. [Medline]. Polley JW, Figueroa AA. Maxillary distraction osteogenesis with rigid external distraction. Atlas Oral Maxillofac Surg Clin North Am. 1999 Mar. 7(1):15-28. [Medline]. Swennen G, Dempf R, Schliephake H. Cranio-facial distraction osteogenesis: a review of the literature. Part II: Experimental studies. Int J Oral Maxillofac Surg. 2002 Apr. 31(2):123-35. [Medline]. Swennen G, Schliephake H, Dempf R, Schierle H, Malevez C. Craniofacial distraction osteogenesis: a review of the literature: Part 1: clinical studies. Int J Oral Maxillofac Surg. 2001 Apr. 30(2):89-103. [Medline]. Uemura T, Hayashi T, Satoh K, et al. A case of improved obstructive sleep apnea by distraction osteogenesis for midface hypoplasia of an infantile Crouzon's syndrome. J Craniofac Surg. 2001 Jan. 12(1):73-7. [Medline]. Lateral postoperative view of a patient with Apert syndrome and an external distractor in place. Note the improvement in the midface projection. Lateral preoperative view of a patient with Crouzon syndrome. Note the obvious characteristics of mandibular prognathism, small maxilla, exophthalmos, and parrot-beaked nose. Lateral preoperative cephalogram demonstrates midface regression despite the use of the traditional approach of osteotomy and immediate advancement. Lateral postoperative view of a patient with Crouzon syndrome and an external distractor in place. Note advancement of the maxilla and correction of mandibular prognathism. Lateral view demonstrates grossly evident maxillary hypoplasia in a patient with Pfeiffer syndrome. 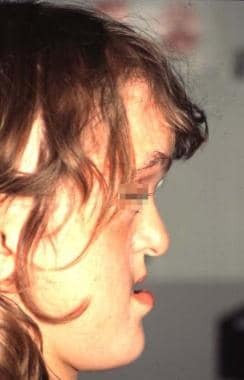 Frontal view of a patient with Pfeiffer syndrome and maxillary retrusion severe enough to require a tracheotomy. Lateral postoperative view of a patient with Pfeiffer syndrome and an internal distractor. Note evidence of midface improvement. Decannulation was performed several weeks later. Three-dimensional reconstructed CT scan demonstrates preoperative maxillary deficiency. Postoperative reconstructed 3-dimensional CT scan in the same patient as in Images 10-11 depicts improved skeletal balance with advancement of the mid face. Postoperative reconstructed 3-dimensional CT scan in the same patient as in Images 10-12 depicts improved skeletal balance with advancement of the mid face. Disclosure: Serve(d) as a speaker or a member of a speakers bureau for: inmode.